Casino Player Publishing reserves the right to substitute any prize with another prize of equal or greater value. Employees of Casino Player Publishing, its respective parent, affiliates, subsidiaries, advertising sponsors and promotional agencies, and the immediate family members of each are not eligible. Entrants agree to abide by the terms of these Official Rules and by the decisions of the commissioners, which are final on all matters pertaining to the give-away. 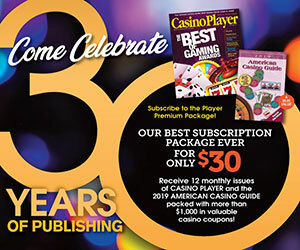 Entrants further grant to Casino Player Publishing the right to use and publish their proper name and state online and in print, or any other media, in connection with the give-away. Casino Player Publishing has the right to use any and all information related to the give-away, including information on contestants obtained through the give-away, for marketing purposes or any other purpose, unless prohibited by law. The winner, by acceptance of the prize, agrees to release all Sponsors, and their parent and subsidiary companies, their officers, directors, employees, agents, shareholders, affiliates, suppliers, distributors, and advertising agencies from all liability, claims, or actions of any kind whatsoever for injuries, damages, or losses to persons and property which may be sustained in connection with the receipt, ownership, or use of the prize. Casino Player Publishing is not responsible for Internet crashes or slowdowns caused by network congestion, viruses, sabotage, satellite failures, phone line failures, electrical outages, natural disasters or acts of man or God. 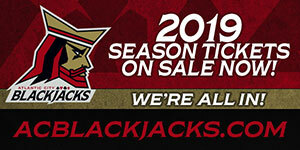 All results posted are unofficial until winners respond to mail notification. The winner is responsible for all federal, state and local taxes and will be required to complete an IRS form W-9. Sponsors reserves the right to withhold prizes until completed form W-9 is received. This give-away is not intended for gambling. If it is determined that a contestant is using the give-away for gambling purposes they will be disqualified and reported to authorities. Casino Player Publishing reserves the right to change the rules at any time.